Crafters In Disguise: We're going to PAX 2012! 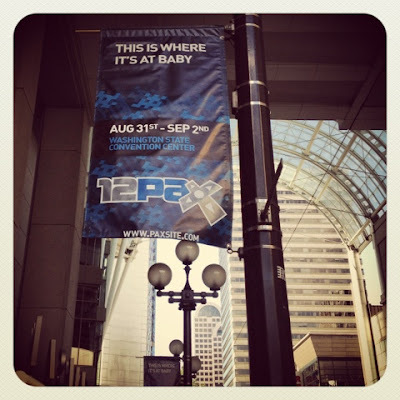 This weekend hordes of gamers descend upon downtown Seattle for the annual Penny Arcade Expo which will take place Friday, August 31st through Sunday, September 2nd at the Washington State Convention Center (and various nearby "spillover" venues, including the Paramount Theater). PAX Dev has been going on already, and today, Thursday, is "setup day". Eager to partake in the weekend festivities, I stopped by during my lunch break today to score a sneak preview while enjoying a Mondito Burrito at the Taco Del Mar inside the convention center. I thought I'd just camp out in the chance of encountering a rare spawn. I heard Wil Wheaton and Gary Whitta were in town already, among other notables. 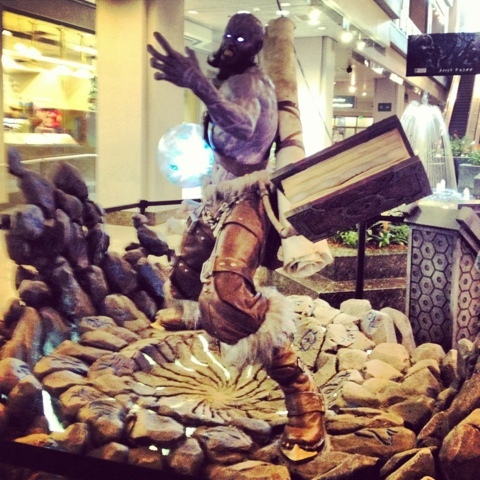 As soon as I entered the venue I was greeted by a massive statue of Ryze, a playable hero from League of Legends. The statue is impressive, a fully lit-up, life-sized replica of the character, complete with floating spellbook, a glowing ball of conjured ice energy, and an impact crater festooned with runes, with blue light emanating from beneath the cracks. I want one for my living room. This is going to cause a major traffic jam on Friday, just wait. A friendly (and dashing) Riot employee saw me snapping (or should I say "tapping") photos on my smart phone and offered to take a picture with me in it. He also conveniently knew exactly the best angle to capture Ryze. 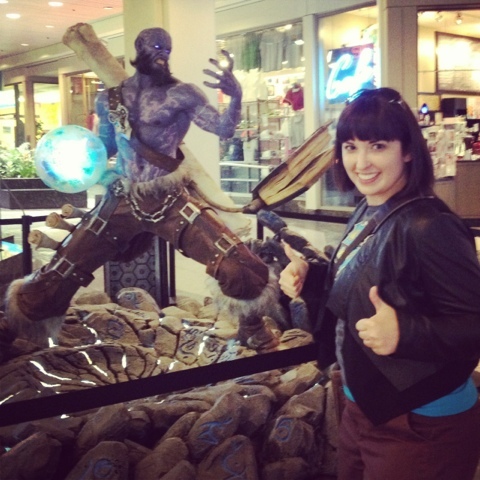 Now I just need to get another photo with Ryze while I'm dressed like Riven!